This conference, organised by the the Boston-based Knowledge Globalization Institute, Boston, MA and Suffolk University, Boston, MA have jointly hosted nine Knowledge Globalization Conferences in Boston (US), Dhaka (Bangladesh), Pune (India) and Istanbul since 2008. The conference covers topics with a broad range of macroeconomic aspects of knowledge. More than 1500 scholars from 42 countries have attended these conferences. Open Collaboration – An attractive Concept for Business and Enterpreneurs? This session is a regular part of the annual Opensym conference, and discusses the concepts of open collaboration processes and technologies from a business perspective. What are the experiences with open innovation, open access in Asia? Does open collaboration with partners, clients and stakeholders speed up innovation? What are the challenges? 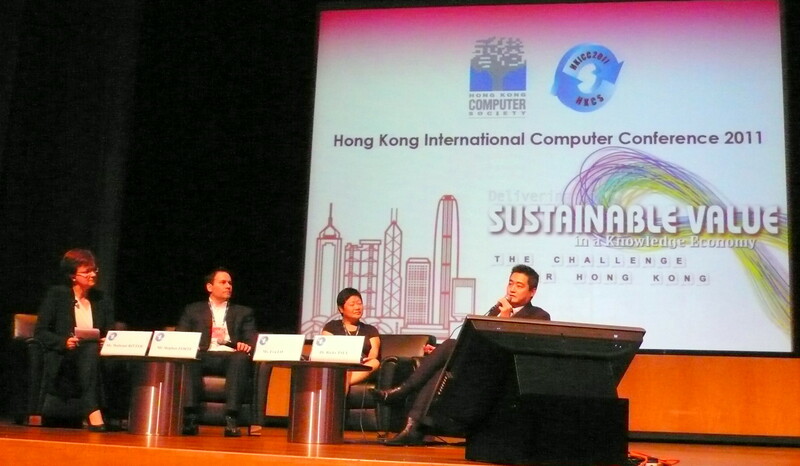 Supported by the ICT Business Council of the European Chamber of Commerce in Hong Kong and InvestHK, two interactive sessions on “Science as an Open Enterprise” and “Collaborative Technologies – How have they changed the way we do business?”, are part of the international WikiSym + OpenSym 2013 Joint International Symposium on Open Collaboration at the Cyberport. Eurocham Panel Discussion: Collaborative Technologies – how have they changed the way we do business? If you are working in client or customer relationship management, business development and strategy, KM, ICT, R&D or marketing, please join us for a networking afternoon with local and international business audience. Call for papers and presentations: http://www.ickm2013.org/Contributions from Hong Kong are welcome. The International Council on Knowledge Management (ICKM) started in 2004 with a conference hosted by the Information and Knowledge Management Society (www.iKMS.org) in Singapore. Prof. Suliman Hawamdeh, the founding chair of the ICKM conference series, who also developed the curriculum for one of the first dedicated M.Sc. programs in Knowledge Management at the Nanyang Technological University in 1999/2000, wanted to create an exchange between academia, practitioners and business around the emerging field of knowledge management. This cross-disciplinary exchange between different groups of professionals interested in KM has never been easy, particularly during the “hype” period of KM from the late 1990 to the end of 2010, where there have been numerous initiatives of semi-commercial, for-profit training and consulting companies and institutes to cash in on the opportunity to create new professional qualifications and degrees with KM in its title. Such efforts to standardize and “certify” KM were often driven by practitioners with an engineering or computer science background, disciplines where knowledge is largely reduced to a process or an object view.The ICKM has stayed clear of all attempts to standardize, commercialize or certify knowledge, and strengthened its professional basis through a peer-reviewed scholarly journal (The Journal of Information and Knowledge Management), conference proceedings published as series on Innovation and Knowledge Management by World Scientific, and non-commercial international conferences. Seminar Review: Leveraging Social Media in the Social SectorHow can non-profit organizations in the social sector develop a strategy for social media? Around 60 representatives of various social NGO attended the seminar on 29 February, organized by Asian Charity Services, to find out more about how social media can help reaching out and connecting to existing and potential supporters and donors and raise awareness for social causes. A survey of 43 of the participating NGOs found that 79% used Facebook, 53% YouTube, 23% Twitter, and 65% used newsletters to update their stakeholders. Some mentioned that it is difficult to measure the effectiveness of social media tools and asked whether it is worth the effort. The introductory remarks by the organizers were very positive towards social media.Most of the invited panelists were from the business sectors, among others from Turner Broadcasting, Swire Hotels, Cathay Pacific as well as independent PR and branding consultants who gave examples of how social marketing greatly supported their communication strategy with customers, and promoted sales and brand awareness through community and “friends” managers. What can the social non-profit sector learn from companies who are using social media as “conversational” marketing tool and new channels of reaching out to new customers?The “conversations” about the food in a hotel are for the most part banal and much less sensitive than conversations about the complex social issues of orphans in China or marginalized groups of people with learning disabilities; and pressing the “like” button for content on the Facebook wall of a human rights group is unlikely to result in action or in a donation.Many NGO were also concerned about privacy, adverse comments on social media sites, and said that non-friendly social media followers can negatively affect the cause. Ethics, content and information governance are critical issues to consider in the communication planning of any NGO, perhaps more important than in the commercial sector, where poor social media communication may result in lower sales and loss of image, but does not risk lives.Another issue is content ownership – what happens to the information (including contact information) if the social platform is discontinued? Centralized social media, such as Facebook, are giant data collection services, and questions over data ownership, copyright and control are an ongoing battle in several countries.In this context it might seem naïve that one of the business social media representatives, who is also member of the Asia Digital Marketing Association, suggested that Social Media are “free” without mentioned the trade-off of paying with personal data for these “free” services. The real cost of social media for NGOs can be quite high – monitoring, analyzing, planning, participating and writing consumes a lot of internal resources and should be taken into account in often resource-stretched and time-starved NGO.What works for NGO in social media?Community building and advocacy were considered the most important aspects of social media, in most cases, social media are only a second tier media channel; a good website, regular e-Newsletters and a database of stakeholders are more important. Social media are useful for broadcasting and listening, less for engaging communities. Some said that social media only attracted “talking” not action.In the introduction to Social Media, Facebook, YouTube, Flickr, Twitter, Google+ and eBlogger were mentioned, however, non-commercial, open and open-source, peer to peer communication and collaborative tools were not discussed, although there are a quite number of such tools, e.g. Wikis or Diaspora. The whole internet is based on open, peer-to-peer sharing, and the principle of open access to content and conversations is important to keep in mind for social NGO. Most social media tools require membership and thereby put a barrier to access content.How accessible are content and conversations in membership-based social media? Many of the tools are not accessible in China, and for an NGO in Hong Kong it is certainly important that potential stakeholders in Mainland China can tap into these channels.Which channels should an organisation use? Is a presence in all channels necessary? Which tools make sense for non-profit organizations? For each NGO a well thought through strategy begins with a discussion on the organization objectives and how these can be supported through an information policy and knowledge management strategy. Limiting the discussion to the usage to certain tools or just jumping on some currently trendy social media platforms is not enough.The workshop was a good forum to start the discussion on empowering NGO through social media, and continuing the exchange between NGO on increasing reach and connectivity within and beyond their existing communities will strengthen civil society in Hong Kong. An interactive session on how to create tangible and intangible value through a KM focused strategic mindset. Is Knowledge Management Losing Sight of the Bigger Picture? At an exhibition at the Art Sonje Centre in Seoul on the reciprocal exchange between individuals and the built environment in cities and urban spaces, one of the exhibits is about a controversial construction project, the Pan Korean Great Waterway, a government promoted mega project on turning natural rivers and eco-systems into a system of concrete channels and dams across the country. The project was disapproved by many as disastrous to the natural environment and sustainable future of the country, and had to be scaled down after massive protests by experts and citizens who described the mega construction project as useless in economic terms, destroying environmental conditions, and producing unprecedented man-made risks. An organization at the centre of this re-engineering project of the environment is K-Water (Korean Water Resources Corporation), a government-owned company with a long experience in dam construction. Just a week earlier I listened to K-Water knowledge managers presenting their KM strategy at the KM Asia in Singapore. K-Water is also one of this year’s MAKE awards winners. MAKE is a marketing campaign by a UK consulting company to benchmark achievements of “most admired knowledge enterprises”. What is K-Water admired for, I was wondering after seeing the exhibition. Is K-Water seeking an active exchange with stakeholders whose lives are affected by this construction project? Is the organization developing leading edge know-how on sustainable water management? Is K-Water developing knowledge strategies to mitigate long term and unknown risks of their projects? Knowledge management practices are often narrowly focusing on internal operations and not addressing larger questions about the nature and sustainability of the knowledge driving the organization. There seems to be a separation of KM from the overall business strategy, a general neglect of addressing the larger questions about an organization’s knowledge and how such knowledge may create societal value beyond a company’s financial gains. At KM conferences we can talk about internal processes and efficiency gains and largely ignore the outer world in which an organization is operating; other than represented through customers or shareholders, the environment does not exist or is not relevant to knowledge managers. One of the main reasons for knowledge management is creating an environment for innovation, and innovation means actively tapping into external knowledge, seeking exchanges with customers, suppliers, partners, citizens and competitors, exploring the space between the known and the unknown. The renewal capital of an organization is largely built on external know-how, insights and ideas and the capacity to absorb such knowledge. If knowledge management ignores this external perspective, it is reduced to a rather shallow operational effort to increase sales, support information sharing within the organization, built internal KM systems or community of practices to support exchanges within very specific, often inward focused domains of expertise. Mars Incorporated, the 30 billion USD multinational junk food giant, for example, created communities of practice around several of their big brands products, and considers KM as fundamental to their sales performance. One of the products, Skittles, contains the following ingredients: Sugar, Corn Syrup, Hydrogenated Palm Kernel Oil, Apple Juice from Concentrate, Less than 2 percent Citric Acid, Dextrin, Modified Corn Starch, Natural and Artificial Flavors, Coloring (includes Yellow 6 Lake, Red 40 Lake, Yellow 5 Lake, Blue 2 Lake, Yellow 5, Red 40, Yellow 6, Blue 1 Lake, Blue 1), Ascorbic Acid (Vitamin C). Few of these ingredients have anything to do with real food, and one might argue that the industrial food industry contributes to decreasing knowledge about nutrition and food in society rather than contributing to informed decision-making on food. Could the organization use KM to establish a serious dialogue with customers? Develop ideas and products for a global, sustainable food production? Ron Young refers to this external knowledge management dimension as “societal capacity of an organization”. Developing this capacity increases the intellectual capital of an organization, reflecting its potential to renew its products and services through an ongoing and critical dialogue with all its stakeholders. Such an external KM dimension could strengthen Petronas, the Malaysian oil company, in their KM strategy, e.g. through increasing its knowledge on renewable energy, developing strategies on how not to use oil or how to use substantially less in a low carbon economy. Apart from technical expertise sharing on deepwater drilling and pressing out the last drop of oil from sand, they could also build knowledge for the post-fossil energy era; knowledge for the future. Another example of a lack of external knowledge perspective is the KM system of the IPOS, the Intellectual Property Office of Singapore, which focuses on IP law administration, IP awareness and operational efficiency, but does not actively develop or incorporate knowledge about the future of copyright, one of the big discourses going on in the many countries. The innovation of the IP system is not developed within the organization, but in the fluid discourse outside the organization, in the international community of content creators, holders and users. How do knowledge managers scan the environment for emerging ideas and feed it back into the organization? Too much effort in current KM systems is spent on retaining existing knowledge, not enough on unlearning and developing new knowledge and practices. Fragomen, a global immigration law firm organization, is building a more dynamic knowledge management function by constantly changing and updating its information base through dialogue with the external world. Due to the nature of its business, the ever changing knowledge about immigration laws and regulation needs to be closely monitored by the knowledge managers, and their KM strategy reflects the need for constant learning. Why is the external KM function vital to an organization? If an organization focuses on internal, operational aspects only, the risk of developing tangible and intangible liabilities increases. Café de Coral, a Hong Kong-based fast food chain had a major organizational crisis in July 2010, after they introduced the minimum wage to comply with a new law. To compensate for the cost, the management stopped paying the break time of their employees, causing resentment among employees and protests in the community and among customers who threatened to boycott the company. The lack of communication with employees demonstrates a lack of understanding the basics of human capital management. The damage to the intellectual capital of the company including image loss was substantial, however, in the same year the company received the MAKE award for operational efficiency through their KM system. The MAKE awards operation itself is an example of focusing on internal KM processes and shareholder value, thus ignoring the bigger picture of an organization. The MAKE organizers say that 500 senior executives and KM experts are nominating award candidates, but obviously few of them study an organization in the context of knowledge, the customers, the environment, intellectual capital accounting that would include externalities such as cost of damage to environment, health and sustainability. Siemens was fined for price fixing in 2007 by the European Commission and bribery in 2008, but won the MAKE awards in 2010. Did the judges review whether management practices, mindset and information governance have changed throughout the organization in such a short time? An interesting statement for a former CEO of a company that was awarded for its knowledge-sharing culture and “Lessons learnt” methods. How can we, as knowledge management professionals, engage in a deeper conversation and exchange about value creation through knowledge, allow more critical questions about existing practices which only touch the surface of real knowledge challenges, in organizations and society?